Corn Chowder using fresh corn, canned whole corn or canned creamed corn are equally delicious. The only question is, how much time and energy do you have to spend on it? Creamed corn is the quickest to make and has a few less ingredients. was decades ago at the Santa Cruz Railway Station restaurant in Santa Cruz, California, when I was going to Cabrillo College. (I don’t think the train-style restaurant is there anymore. Does anyone know if it is?) I was amazed at how delicious the chowder was. The chef gave me the recipe and I’ve been cooking it every since. * Important: Most canned creamed corn contains no preservatives or additives, making it one of the more appealing convenience items on the supermarket shelf. If using canned cream-style corn, do not use the salt, flour or water. Add milk 1 to 1 with the cream-style corn. I prefer using cream-style corn because it makes this recipe super easy – and it tastes excellent! Into your cooking pot, add corn and milk and start to heat on medium. Add potatoes, celery and carrots right away. Simmer for 30-45 minutes until the veggies are tender. ** If using canned whole-kernal or raw corn, bring the liquid just to the boiling point and add 2 tablespoons of flour pre-mixed in 1/2 cup of milk. Heat for about 5 minutes and then add the corn. Add 1/2 cup of water and milk as desired for consistency/thickness. If using canned cream-style corn do not add the water, flour or salt. If you’re adding cooked meat, add it to the chowder and heat for 2-3 more minutes. Sprinkle with parsley or paprika if desired. 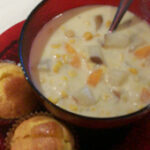 This Corn Chowder is SO delicious and goes great with corn bread!